The Ae270 Delivers Powerful Productivity and Compelling Economics. Introducing the Ae270: Ibis Aerospace’s new propjet will deliver powerful productivity and compelling economics for the business traveler. 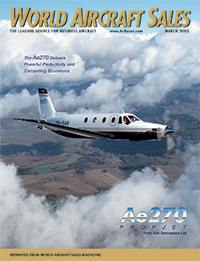 This article was published in World Aircraft Sales Magazine, March 2003.